The memories of our lives are present everywhere we look and with many people that we meet. 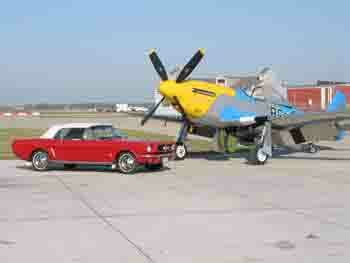 So it is with Bev A. who along with her late husband Gordon became enchanted with Mustangs many years ago. 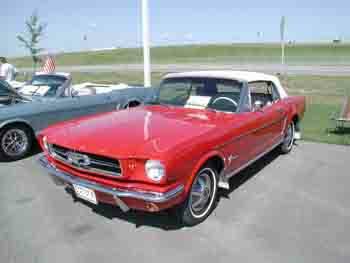 The Candy Apple Red with White 1964 ½ convertible that you see here was purchased way back in 1983 in Detroit Lakes, Minnesota. It was a solid car and in decent shape, but like many, it begged for the attention to restore it to its original condition. Bev and "Gordy" drove the car for a few years before deciding in 1987 to have Clarence’s Louver Body Shop in Fargo, N.D. do the necessary restoration of this classic. The restoration and the quality of work done by Clarence's in 1987 are still very evident today. The few body blemishes were repaired and a new coat of the Candy Apple Red was applied. Soon after a new white convertible top was installed and then attention turned to the cars interior. The new interior is based upon the beautiful white comfortweave seats that set this car apart from all others. The Sprint 200 six cylinder engine was tuned up and the convertible was once again ready for the road, a classic car with a new "facelift" Since finishing the restoration, the convertible has had a new exhaust system installed, new tires and complimentary mud flaps added all the while having necessary maintenance items done religiously. In 2002, Beverly lost her beloved husband Gordy. The Mustang was always in the middle of all family functions and Bev, as a promise to her late husband, keeps it that way today. Gordy’s sprit is kept alive in Bev’s love of driving and showing the results of her their devotion to this car. 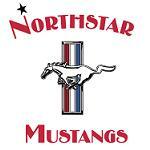 Bev's enthusiasm is evident by her involvement and sharing her love of this hobby and shares that enjoyment with her fellow members of the Northstar Mustangs Car Club. During the warm weather months, you’ll find Bev and her sisters of the "Red Hat Dollies" club enjoying the car in parades and events throughout the Red River Valley. 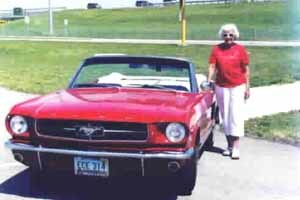 Her enthusiasm to this hobby is evident when driving the Mustang keeps Gordy’s spirit alive. Her spirit and genuine warmth is evident to everyone that this wonderful lady meets!